Well, for all you people interested in making tracks, this is an explanation on how to get started, I (Austin) have been asked many times what to do, but its hard to explain, in this section I'll try to give explanations on how it works, with pictures to show what i mean. This is used to select rooms/walls so that you can change different aspects of them. This is used to change the shapes/sizes of rooms and to separate rooms if needed. This is used to move a selection of track around (if you have a bit selected). This is used to make a room. This is used to make start positions/checkpoints/finish lines/fuel sources/speed zones/inflating columns/mines/boosters. 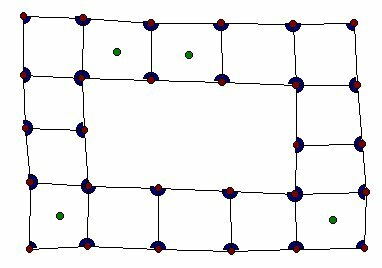 This is used to make a node path, I've never seen one before, so you don't need to used it. This is used to cut objects, but I've never seen this used either, so you won't need it. This is used to add an extra side to a room. This is where you'll change things about rooms/entities/your track. These will all be used in the tutorial, so you will learn how to use these. Now you have a room. 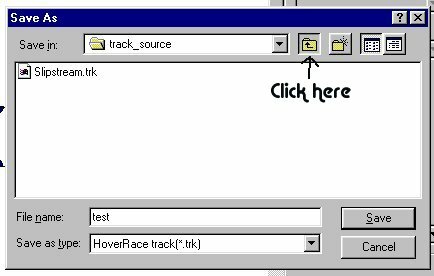 Click the entity icon and click inside the room to create "Start position 1"
Open tracks by double clicking and save test, you will be given warnings that positions 2 to 10 are not there, but that's ok, so click ok. You are then ready to run your track, as long as the compiler runs successfully. Open HoverRace and try your track, you should get a square room, with no walls and a ugly background, but you have learnt the basics of making a room, WELL DONE! If you want to put in walls then select the arrow icon and highlight the room, by holding the left arrow and dragging it across, then you will see that you can change the wall/ceiling/floor texture as well as the floor/ceiling level in here, so feel free to play around with them, you can compile it over and over, so it can be changed. Now you know how to make a room its time to make a track, we'll be making a square track, it will all be kept on the same height, so that you can get to grips with making a circuit. Now we can put some walls into the track. Using the arrow icon select the whole track (by left clicking and dragging a box over the track), then set the "Wall Texture" to "Gray wall", now again using the arrow icon, select the "Finish Line" box and set "Wall Texture" to "Checkers" and the "Floor Texture" to "Checkers", save the map, and then compile it, you will get the same error messages that there isn't start positions 2 to 10, but that's ok, your track is now complete, test it and you'll see. Well, you've made a track now, and its not exactly great, but now you know how to do it, you can make better ones in the future. This section is going to explain how to add 3d objects/mines/boosters/pit zones/speed zones/all starting positions/inflating columns, so you'll know all you need to know when you start making your own. 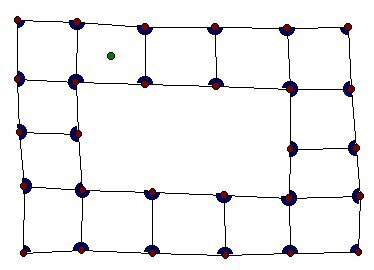 3D objects must be inside a room, the reason being is that if not, you'll find that the walls are 'sticky' or hollow, which isn't what you want. 3d objects can be used for a lot of things, making walls, making jumps, splitting tracks, but each 3d object cannot pass into another room, you can have multiple 3d objects in a room, and 3d objects in all the rooms, but you must have a 3d object inside a room. 3D objects are made with the 3d object icon , as the icon shows, the object is inside the room. Mines are easy to put in, click the entity icon place one, and change the "Item Type" to "Mine"
Boosters are also easy to put in (you do it just like the mines), but you might have to change the height (Z) by the item type, to make them look right. Pit zones are best well placed, so that they are accessible and not in the way of others. making a pit zone is easy, you just use the entity icon and place it inside a room, then change the "Item Type" to "Fuel source", the room is now a pit zone, I suggest adding colour to the walls and floor(The "Fuel Zone" wall texture) so that racers know where to stop for fuel. You can have multiple fuel zone entities so that it fills faster, and you can have multiple fuel zones around the track. These are not to be played with, you must use these sensibly, as placing a speed zone is something that can be done when the circuit is easy to navigate at the high speeds. To place a speed zone you do the same as with the fuel zone, except placing more speed zones in a speed zone doesn't work for more speed, and I suggest using the Speed Zone texture for the walls and floor. You need to place all 10 positions so that the track can be raced by the max amount of players. Placing them is the key to a good track, if player 1 has an unfair advantage then the track won't be liked. Try placing them well, e.g. Steeplechase, the first 5 are lined up well so that the first corner is close and then back 5 have the same problem, Alley2 is hard because you all arrive at the speed zone at the same time. You should know by now how to place the ten drivers, but another thing is the angles of the craft, which are edited by "Angle". They are the angles to face the craft where you want it. These are used as obstacles to cause problems for drivers, you can place these like any entity, I suggest you put it at height (Z) 0.5 as this is the height needed to have them at floor level, just be careful how you put them in as it can be hard to steer quick enough to avoid them. This section covers how to put colour on your walls/floor/ceiling and make different heights on your track, its only a small section, but it makes it easier to understand and your tracks much prettier. To select a wall you need to select the arrow icon and hold shift down, click the two angles that you want to change the wall texture on, you'll now be able to change the texture of the wall. You have to highlight a room to change the floor/ceiling texture, which you will have learnt in an earlier section. 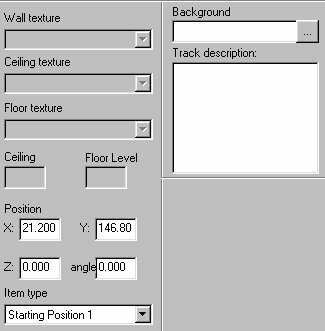 To change the height in a track, you have to select rooms/a room and the change the "Ceiling Level"/"Floor Level". The crafts can all jump 1 in height, so if you want a jump they can do, then do only 1 difference so that the craft can make it. Otherwise 2 higher will be fine for jumps that can't be made. 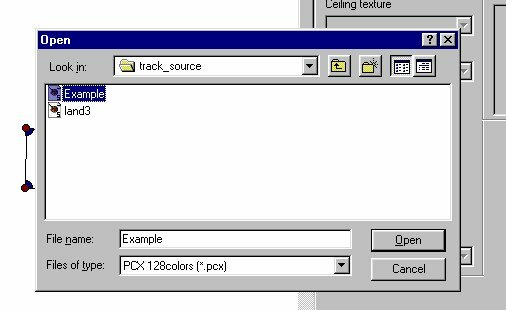 The "Track Description" is a space to fill in what the track is about and what craft to use. Thanks to Hannibal for bringing this to my attention. 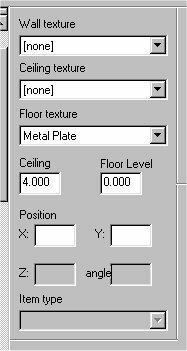 you can use minus values in each (the default values are 4 and 0), the room can be any size, but I suggest keeping it at 8 difference maximum, as this will make the rooms look good still. For a pit which cannot be got back out of, you should use -3 or -2 (-3 is a pit that you cannot jump and fire out of, -2 is a pit you can jump and fire out of (but you can't get out of either)) It has to be 3 difference in height for the pit to work, so say if the floor level was -4 in that section, you'd have to have the pit at floor level -7. (the default values are 4 and 0), the room can be any size, but I suggest keeping it at 8 difference maximum, as this will make the rooms look good still. For a jump you need to make the floor 1 higher than the last section of track, this creates a jump effect. 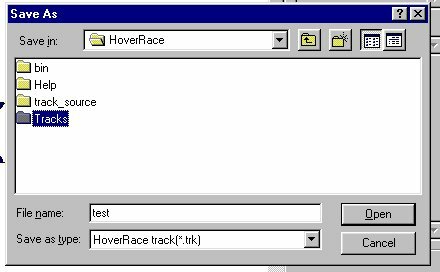 "You need to register HoverRace to compile maps"
"HoverRace is not registered, you must register to use this feature"
That means you need to "Enable HoverCAD" which is in the HoverRace Start Menu folder, this will enable HoverCAD's compile feature.